“Immigration harms” undermine the positive economic and social benefits of immigration and in some cases produce economic and social costs that may outweigh the benefits of migration. These risks of migration are extensive, and they include the exploitation of workers, the erosion of working standards, the presence of illegally resident persons that undermine the rule of law, profit to criminal enterprises, government corruption, potential adverse fiscal and welfare consequences, and—at their most severe—violent criminal activity. This report, part of a Transatlantic Council on Migration series that examines migration "bad actors," analyzes how governments ought to best allocate their resources to address these harms, including choosing which threats to tackle and where to prioritize enforcement efforts. The report explores how immigration policymakers can learn from other public policy regulation efforts to ensure that regulatory actions advance the public interest. 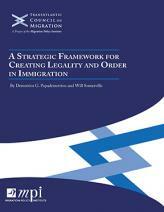 After assessing a wide range of tools that immigration policymakers have at their disposal, the report concludes that an effective and strategic enforcement regime to tackle immigration harms includes: (1) the abiilty of governments to generate new evidence and analysis to improve their operational understanding of the threats they face; (2) an allocation of resources the scale and intensity of the violations, as well as the cost-effectiveness of policies designed to address them; (3) strong partnerships across government agencies; and (4) decisions based on transparent criteria that all participants in the system can understand.